Lawrence was the most fashionable and also the greatest portraitist of his generation. He was made Principal Painter to George III in 1792 after Reynolds’s death, and received occasional commissions; however it was only after 1814 that George IV began to employ him in earnest. 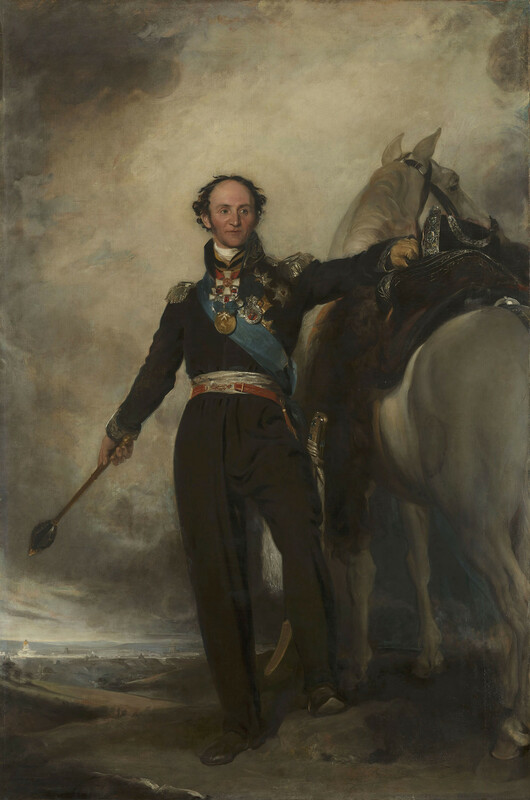 This portrait was commissioned by George IV at a cost of 400 guineas and was painted in London in 1814 and exhibited at the Royal Academy in 1815, though it remained in Lawrence's studio until his death. The portrait seems to have always been intended for what became the 'Waterloo Chamber' and acknowledges the sitter’s role as leader (or ‘Hetman’) of the Cossacks, who inflicted such heavy casualties on the retreating French army in 1812. Platov was part of the Russian mission to London in 1814 though he could speak no English or French and is generally described as something of a wild man. In this portrait he wears the uniform of a Cossack General, resting his hand with his hat upon the saddle of his charger and pointing with a baton to a city in a distant landscape. The is the most striking example of a common type – a Lawrence portrait which seems to have been inspired by the works of Velazquez. The daring and dramatic way in which a flat and almost uniform black silhouette is set off by a subtly variegated buff-brown background appears to have been learned from Velazquez 1650s portrait of the actor, Pablo de Valladolid (Prado). There is no evidence that Lawrence could have seen this portrait or a version of it, but there are many other paintings by Velazquez with similar devices and he was an artist much talked of in Britain in the early years of the nineteenth century. The Waterloo Chamber is a great hall on the public route at Windsor Castle displaying portraits of those soldiers, sovereigns and diplomats responsible for the overthrow of Napoleon and the re-establishment of the monarchies and states of Europe thereafter. The concept began in 1814 when George IV used the opportunity of the Treaty of London to commission Lawrence to paint distinguished visitors. The group of portraits grew during the next decade as Lawrence continued to obtain portrait sittings at the various congresses following the Battle of Waterloo in 1815 and, in some cases, by making special journeys. Most of the twenty eight portraits were delivered after his death on 7 January 1830. By this time work was already begun of the space of the Waterloo Chamber created by covering a courtyard at Windsor Castle with a huge sky-lit vault; the room was completed during the reign of William IV (1830-7). The first illustration of the interior is provided by Joseph Nash (1809-78) in 1844 (RCIN 919785) and shows the arrangement which survives to this day: full-length portraits of warriors hang high, over the two end balconies and around the walls; at ground level full-length portraits of monarchs alternate with half-lengths of diplomats and statesmen.